I am a serious fan of grain salads. What’s not to love? They’re healthy, flavorful, and even better when made ahead. After preparing many of these salads for both my clients and myself I realized that a recipe isn’t necessary, so much as a formula. You can mix and match ingredients based on what you have on-hand, what’s in season, or what you’re craving. Concoct a Greek-ish grain salad, or a Latin-ish one, an Asian-ish one, or a whatever-is-in-your-fridge one. They are as flexible as they are delicious. Simple right? Start with your basic components and go from there. 1. The Grain. 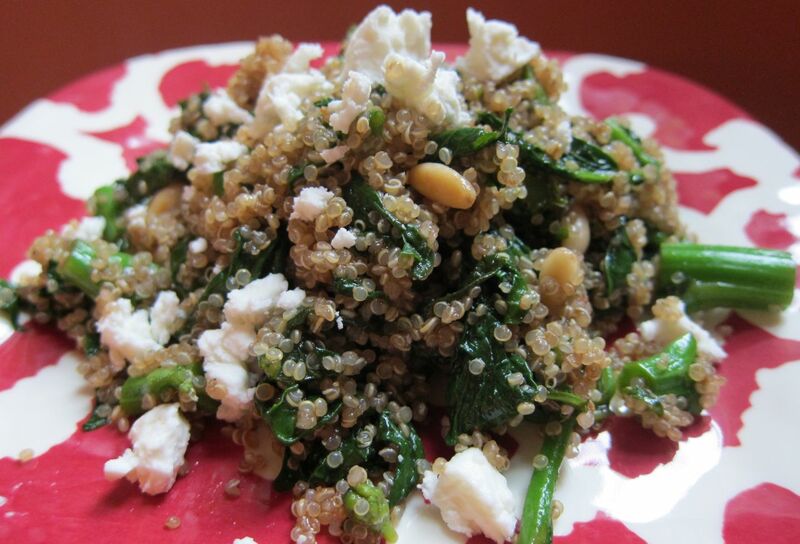 My favorites are quinoa and farro. Other options include barley or brown rice (not a grain, but a good stand-in). Cook one cup of the grain in salted water according to package directions and let it cool either in a large bowl, tossing frequently, or ideally, in a thin layer on a parchment-covered baking sheet. This will keep the grain from getting gummy. 2. The Vegetables. Raw or cooked. Roasted, steamed, or boiled. Freshly cooked or leftover. Your vegetable options are legion. In this photo you’ll see that I used chopped up broccoli rabe. It was sautéed for the previous night’s dinner, and I used the leftovers in my salad. Often, I roast a mess of vegetables for these salads. One of my favorite combinations is cherry tomato, zucchini, orange bell pepper, and olives. If you’re cooking your vegetables specifically for the salad let them cool before proceeding. 3. The Dressing. Again, you have options! Ideally, make your own dressing using extra-virgin olive oil and a vinegar you like. Here is my ratio: ¼ cup extra-virgin olive oil, 1-2 Tablespoons acid (balsamic, a wine vinegar, or citrus juice), ½ teaspoon kosher salt, and freshly ground pepper to taste. Whisk in a bowl. For the simplest formula, stop here. Once the grain and the veggies are cool toss them together gently in a large bowl. Add about half the dressing to start, using more if you think the salad requires it. Taste for seasoning; you will probably need to add more salt. Don’t be shy. Make sure your salad is flavorful. 4. Toasted Nuts/Seeds. They add a welcome crunch and more nutritional power. My favorites are pistachios, pine nuts, walnuts, and pepitas (hulled pumpkin seeds). Use about a ¼ to ½ cup and toast them on the stove-top or in a 350° oven for 5-10 minutes. 5. A Fresh Herb. Some chopped parsley, basil, chives, or cilantro adds eye appeal and another layer of flavor. 6. Cheese. A little crumbled cheese on top of the salad contributes a creamy richness that makes the dish even more satisfying. I find myself opting for feta most of the time, but cubed mozzarella, goat or another crumbly cheese would be equally delicious. 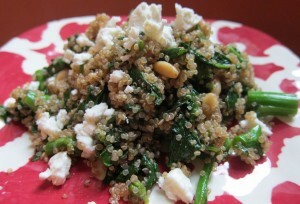 This entry was posted in Blog and tagged grains, Recipe, salads, vegetables. Bookmark the permalink. I’m glad you posted about this. I have been looking for some alternate salad types. Maybe I will get John to eat quinoa! Allison – have you tried farro? It’s my favorite, and I bet John would like it. Thanks for the comment! Let me know if you come up with some interesting combinations.